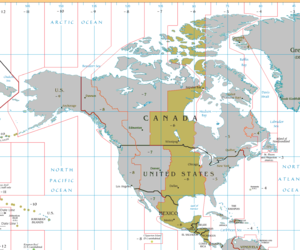 The North American Central Time Zone (CT) is a time zone in parts of Canada, the United States, Mexico, Central America, some Caribbean Islands, and part of the Eastern Pacific Ocean. Central Standard Time (CST) is six hours behind Coordinated Universal Time (UTC). During summer most of the zone uses daylight saving time (DST), and changes to Central Daylight Time (CDT) which is five hours behind UTC. The province of Manitoba is the only province or territory in Canada that observes Central Time in all areas. Note: Although all of Alabama is legally on Central Time, Phenix City and the nearby community of Smiths Station unofficially observe Eastern Time, as these areas are part of the metropolitan area of the considerably larger city of Columbus, Georgia in the Eastern Time Zone. Lanett and Valley observe Eastern Time historically because they were textile mill towns and the original home office of their mills was in West Point, Georgia. Most of Mexico—roughly the eastern three-fourths—lies in the Central Time Zone, except for six northwestern states (Baja California, Baja California Sur, Chihuahua, Sinaloa, Sonora, and *most of Nayarit) and one southeastern state (Quintana Roo). Belize, Costa Rica, El Salvador, Guatemala, Honduras, and Nicaragua all use Central Standard Time year-round. The Galápagos Islands in Ecuador uses Central Standard Time all year-round; the remainder of Ecuador uses Eastern Standard Time. Both Easter Island and Salas y Gómez Island in Chile uses Central Standard Time during the Southern Hemisphere winter and Central Daylight Time during the Southern Hemisphere summer; the remainder of Chile uses Atlantic Standard Time and Atlantic Daylight Time. Daylight saving time (DST) is in effect in much of the Central time zone between mid-March and early November. The modified time is called "Central Daylight Time" (CDT) and is UTC−05:00. In Canada, Saskatchewan does not observe a time change. One reason for Saskatchewan's lack of a time change is that, geographically, the entire province is closer to the Mountain Time Zone's meridian. The province elected to move onto "permanent" daylight saving by being part of the Central Time Zone. The only exception is the region immediately surrounding the Saskatchewan side of the biprovincial city of Lloydminster, which has chosen to use Mountain Time with DST, synchronizing its clocks with those of Alberta. In those areas of the Canadian and American time zones that observe DST, beginning in 2007, the local time changes at 02:00 local standard time to 03:00 local daylight time on the second Sunday in March and returns at 02:00 local daylight time to 01:00 local standard time on the first Sunday in November. Mexico decided not to go along with this change and observes their horario de verano from the first Sunday in April to the last Sunday in October. In December 2009, the Mexican Congress allowed ten border cities, eight of which are in states that observe Central Time, to adopt the U.S. daylight time schedule effective in 2010.